Anthony Michael Sabino is a practicing attorney and nationally recognized expert on a variety of legal subjects. Formerly judicial law clerk for a prominent federal judge, he has published well over 100 articles for the nation’s leading law reviews and journals, which in turn have been cited by some of the country’s highest federal appellate courts, including the Fifth and Seventh Circuit Courts of Appeals, the D.C. Circuit by now-Justice Ruth Bader Ginsburg, as well as by many Ivy League and other renowned law reviews. Prof. Sabino has written some of the leading articles on white collar crime, securities fraud, arbitration, bankruptcy and corporate law. Professor Sabino has been interviewed on television (including ABC, NBC, CBS, CNN, Bloomberg TV, CNBC, Fox News and the BBC) and radio (including WCBS, WINS, WWOR, WABC, KABC (Los Angeles), Bloomberg Radio, AP Radio and NPR) as an expert on: the trials and sentencing of Rajat Gupta, Raj Rajaratnam and Martha Stewart; the GM, Chrysler, Enron, WorldCom and airline bankruptcies; numerous “white collar” and securities fraud trials; the Microsoft antitrust cases; and many other legal controversies. He has been quoted by the Wall Street Journal, New York Times, Bloomberg.com, Forbes, MarketWatch, Dow Jones, Washington Post, Chicago Tribune, Boston Globe, Miami Herald, and other newspapers and publications across the nation and the world. He practices law with Sabino & Sabino, P.C., Mineola, New York, and maintains a vigorous legal practice in a variety of fields, representing corporate and individual clients in the federal and state courts, in arbitrations and mediations at the stock exchanges and elsewhere. 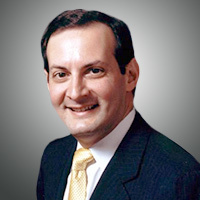 He is a fully trained arbitrator and mediator for FINRA, the Southern District of New York, the Nassau County state Supreme Court and other organizations. Professor Sabino currently serves as secretary of the Nassau Academy of Law, and frequently organizes and lectures at continuing legal education seminars. He has chaired the Federal Courts, ADR, and Corporate, Business & Securities Law Committees of the Nassau County Bar Association, and is a former NCBA director. He is active in numerous other charitable and civic organizations. Professor Sabino is admitted to practice before the United States Supreme Court, the bars of New York and Pennsylvania, and numerous federal appellate and district courts across the nation.